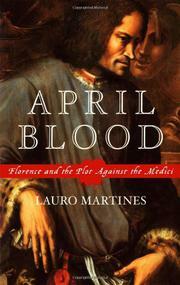 A vivid, dramatic account of conspiracy and murder in 15th-century Florence. One of the most illustrious dynasties of the Renaissance, the Medici began their ascension in a city-state reeling from debt and high taxes after years of expensive warfare. Within three generations, they had established a merchant bank and a commodities empire that made them the richest family in Florence. Through brilliant political machinations—Machiavelli is generally supposed to have been inspired by them when he wrote The Prince—they became the leaders of the so-called Florentine republic. The Medici dynasty culminated in Lorenzo the Magnificent; aggressive and ruthless, he was also a brilliant poet and a lavish patron who commissioned works from great artists and composers of the day. Lorenzo’s tyranny inevitably fostered discontent and cabal. Members of the Pazzi, an older Florentine family resentful of the parvenu Medici, attempted to assassinate Lorenzo in the city’s cathedral on an April Sunday in 1478. They failed but managed to kill his younger brother Giuliano. An enraged Lorenzo struck back, and through a virtuoso admixture of murder and legislation virtually eliminated the Pazzi’s existence. Renaissance historian Martines (Power and Imagination: City-States in Renaissance Italy, not reviewed) tells the story with a breathless enthusiasm that is infectious. He has walked the Florentine streets and buildings many times, conveying the agreeable impression of a personal tour. This story is not for the squeamish, however. It was a hideously violent era, and Martines does not flinch when describing the gruesome punishments meted out to the Pazzi conspirators and their innocent relatives. The only minor flaw occurs in the chapter describing the attempted assassination, where the unnecessary reintroduction of the main players suggests that the author originally intended it as the first chapter. History as it should be: informative but also lively, thrilling, and hugely entertaining.